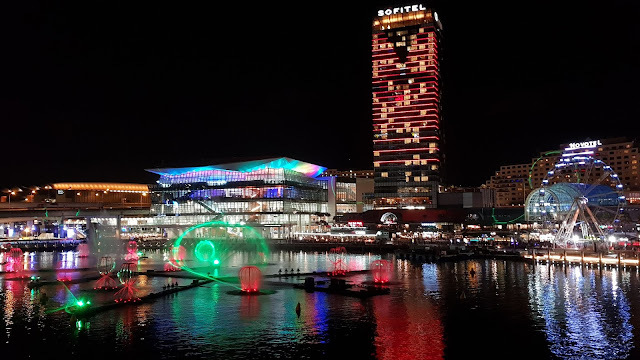 This view of the International Convention Centre Sydney and the Sofitel Sydney Darling Harbour Hotel, behind Harbourside shopping centre at Darling Harbour is from Pyrmont Bridge. ''Fantastic Oceans'' is an art-meets-technology water fountain, light and laser experience on Cockle Bay, which is part of the Vivid Sydney festival, which is running from 25 May to 16 June, 2018. 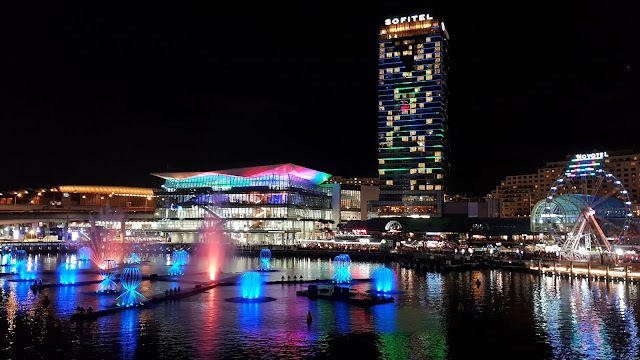 It was created by Australian Glenn Turner from Oracle Liquid and celebrates an environment where bio-luminescent creatures live deep beneath the ocean. The buildings also feature light displays for the festival. It all looks like a magical rainbow from a distance. If I ever make it to Australia, I want it to be during this festival!! Your reflections are always fun to see.